Announcement Welcome to ArtBirdsNature (formerly berkeleySU) - Prints and Art from Nature. Ken Januski is an artist living in Philadelphia, PA. All of my recent work focuses on nature, birds in particular. I have exhibited in the annual exhibition of the Society of Wildlife Artists in London in 2011, 2012 ,2015, 2016 and 2018. Though there are numerous bird and wildlife art juried shows this is the only one that I make a serious attempt to get into. In 2011 and 2012 my work reached the finalist stage in the BBC Wildlife Artist of the Year competition.I am not British. My background is thoroughly American. I just find British and European wildlife art the most appealing. This store was formerly called berkeleySU, a tip of the hat to the place where I began my printmaking education, the basement of the student union at UC Berkeley. As the store primarily sold my prints when I opened it seemed appropriate. But I have a very lengthy history in abstract art. I also have a fairly old blog called Art, Birds, Nature which seems to well summarize my interests. In 2016 I finally decided to try to unify my blog and my Etsy store by using the same name for both. The store now includes work in linocut and woodcut as well as watercolor, acrylic and various drawing media. In 2017 I also began working in moku hanga, a Japanese method of woodblock printing. That is also shown here. My older strictly abstract work is also available on Etsy at OldAndAbstract. Welcome to ArtBirdsNature (formerly berkeleySU) - Prints and Art from Nature. Ken Januski is an artist living in Philadelphia, PA. All of my recent work focuses on nature, birds in particular. I have exhibited in the annual exhibition of the Society of Wildlife Artists in London in 2011, 2012 ,2015, 2016 and 2018. Though there are numerous bird and wildlife art juried shows this is the only one that I make a serious attempt to get into. In 2011 and 2012 my work reached the finalist stage in the BBC Wildlife Artist of the Year competition.I am not British. My background is thoroughly American. I just find British and European wildlife art the most appealing. American Kestrel with American Robin Linocut. The print arrived quickly and was well packaged. Very pleased with the print and transaction! Beautiful piece of art. Quick shipping. Item arrived in perfect condition. Beautiful watercolor. This is my second purchase from this artist, and I am very happy with it. Two prints just returned from London. Tagged photo was in SWLA Annual Exhibit - Ruby-throated hummingbird and Turkey Vulture. Recently returned work from London, where the two prints at top were in The Society of Wildlife Artists 52nd Annual Exhibit. All but the Great-crested Flycatchers are currently for sale on the Etsy store of berkeleySU. Two trial proofs of American Woodcock moku hanga print, along with the yellow block and some carving tools. Moku hanga chisels, woodblocks, and paint jars in the background. It's my main printmaking medium as of 2017. 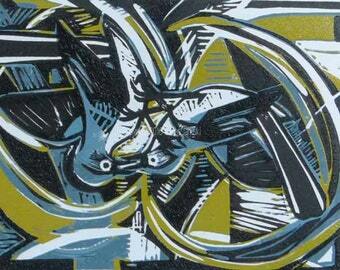 Last stage of liinoleum block for 'Green Heron with Twelve-spotted Skimmer' reduction linocut. Working proofs, with tcarving tools and woodblock, for woodcut of American Goldfinch in late November, 2014. One side of the announcement for the Society of Wildlife Artists' Annual Exhibition in Oct./Nov. 2016, I was in it. I started my shop in late 2010 about the same time I took up linocut for the first time ever. Etsy like the perfect place to show and sell this type of multiple-edition work. Eventually I added other types of prints as well as other types of painting and drawing to the shop. Since 2017 my main printmaking medium has been moku hanga, or Japanese woodblock. I've been an abstract artist for about 30 years and only turned to naturalism in 2006. My interest in birds, nature and the outdoors became my main artistic subject. Slowly I added media that I used abstractly to my naturalist portfolio. So now I work in watercolor, charcoal, pastel, and acrylic as well as linoleum block, woodblock and moku hanga. In 2011, 2012, 2015 and 2016 I exhibited in the annual exhibit of the Society of Wildlife Artists in London. In 2011 and 2012 I was a finalist for the BBC Wildlife Artist of the Year in the International Category. I also have exhibited numerous times in the Gallery of the Commons the online gallery of Wildlife Art Journal. Ken Januski is an artist based in Philadelphia, PA. After about 20 years as an abstract painter, he turned to insects and then eventually birds in 2006. He currently works in watercolor, linocut, woodcut, moku hanga, acrylic, charcoal and pastel. Once I sell an item to you Etsy in turn lets me know your name and address so that I can mail the item to you. That is the extent of my current use of your information. I do not personally collect your email address though Etsy allows me to contact you via their Convo mechanism. So they have your email address but I do not. I do not use mailing lists to contact previous customers. Etsy does not allow me to contact you after a transaction has been completed so I don't have access to any of your information other than your name and physical address. Even if they did allow this I do not do so. I don't share your information with any third parties. My only purpose in using your information is to be able to complete the transaction. Once I sell an item to you Etsy in turn lets me know your name and address so that I can mail the item to you. That is the extent of my current use of your information. I do not personally collect your email address though Etsy allows me to contact you via their Convo mechanism. So they have your email address but I do not. I do not use mailing lists to contact previous customers. Etsy does not allow me to contact you after a transaction has been completed so I don't have access to any of your information other than your name and physical address. Even if they did allow this I do not do so. I don't share your information with any third parties. My only purpose in using your information is to be able to complete the transaction.